Apologies, fans! I left out the amount of coconut milk in my last recipe, so I corrected it. 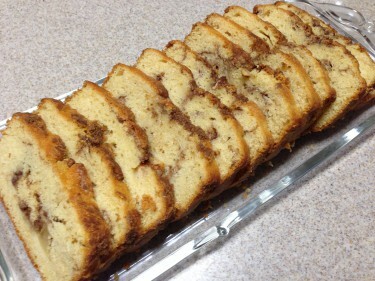 Go to the blog to see the corrected recipe, or if you’re already at the blog, just scroll down. Here is a yummy recipe from the folks at the MediterrAsian blog, which showcases healthy foods from the Mediterranean and Far East. Read the recipe through a few times before you start. Mix up the spices for the chicken rub and the couscous at the same time, because both parts of the recipe use pretty much the same spices and that way you’ll have to take them out only once. Prepare the chicken first, and while it’s resting and then baking you can prepare the couscous. Combine the ingredients and boil the stock while the chicken is baking, and when it comes out of the oven to rest for 5 minutes, put the couscous salad together. You may notice from the photo that there’s no red onion or red pepper in the dish. That’s because I didn’t have either one on hand, so I used regular yellow onion and yellow pepper. Feel free to do likewise. The couscous salad can be prepared separately and served with other dishes or it can be a vegetarian main dish. It would be great with grilled salmon. 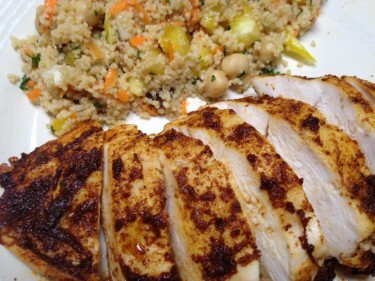 The chicken makes enough for two servings, unless you use huge chicken breasts, while the couscous salad will serve at least four. Save the leftovers for another meal. You can reheat it or enjoy it cold. Mix together the cumin, paprika, ginger, cinnamon, chili, salt, and garlic until well combined. Mix in the oil to create a paste. Rub this evenly over both sides each chicken breast. Cover and set aside in the refrigerator for at least 20 minutes. Place on a baking tray or in a baking dish lined with foil and bake for 20 minutes. Allow to rest for 5 minutes, then cut into slices to serve. In a jar with a lid combine the olive oil, lemon juice and spices and shake until well blended. Combine the carrot, bell pepper, onion, chickpeas and parsley and set aside. In a heatproof serving bowl, combine the couscous and raisins. Boil the chicken or vegetable stock and pour it over the couscous; stir, and cover with plastic, foil or a plate so it can steam. Leave for 5 minutes. Fluff the couscous and add the vegetables. Pour the dressing over all and mix well. This is a perfect recipe for these frigid days. You’ll know what I mean if you live anywhere in the top half of North America. If you’re one of the lucky ones who is not freezing your tushie off this week, you might want to save this one for colder days. 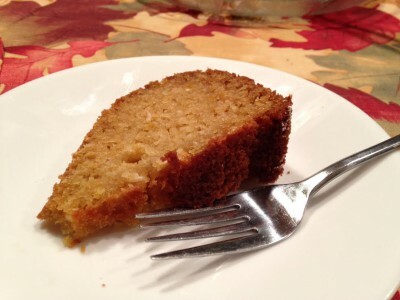 The recipe came from my friend Greta Zalman, who adapted it from a recipe in Cooking Light magazine from 2010. It’s very flavorful and – be forewarned – quite spicy. Our synagogue recently hosted a group of homeless people for a week – Christmas week to be exact. Greta multiplied this recipe by four and served it for Saturday night’s dinner, where it was scarfed up by our guests. Here a few comments and tips. It’s a lot easier to buy peeled-and-cubed butternut squash from Costco, Whole Foods or Trader Joe than to peel and cube your own, even though it’s quite a bit pricier. Ditto for roasted peppers; buy a jar of them from Trader Joe and save yourself a lot of hassle. I like to roast the butternut squash before adding it to the pot, but if you’re pressed for time you don’t have to. 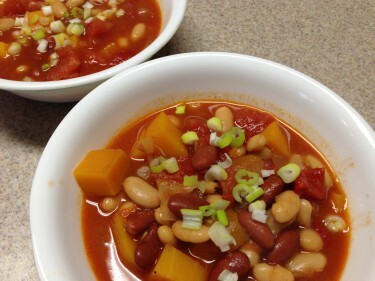 If you don’t have the three kinds of beans, use three cans of any kind of beans. If you want to roast the squash, preheat the oven to 425 degrees. Spread the squash cubes in a single layer on a lightly oiled baking sheet and roast for about 20 minutes, stirring once or twice, until the squash starts to caramelize and brown. Set aside. Do the next five steps if you don’t have a jar of roasted peppers. Cut bell peppers in half lengthwise. Remove and discard seeds and membranes. Place pepper halves, skin sides up, on a foil-lined baking sheet. Broil 15 minutes, until blackened. Place pepper halves in a zip-top plastic bag; seal. Let stand 15 minutes. Remove the charred skin and chop the peppers. Heat a Dutch oven over medium-low heat. Add oil to pan; swirl to coat. Add onion and cook 15 minutes, stirring occasionally. Stir in cumin, red pepper, paprike, salt and garlic; cook 2 minutes, stirring frequently. Add bell peppers, broth, squash, and tomatoes; bring to a simmer. Cook 20 minutes, stirring occasionally. Add beans; simmer 25 minutes or until slightly thick, stirring occasionally. Sprinkle with green onions and, if desired, shredded cheese and tortilla chips.